The Skills and Endorsements section on LinkedIn has become a staple of the LinkedIn profile. Because you can have up to 50 Skills listed, it can be challenging to decide upon a strategy with them. Which do you list, which do you highlight, how do you get your network to endorse you? While those are valid questions, don’t let them stop you from using this section. It’s a keyword bank that the system uses to return better results when users search. Here’s my advice: While you are deciding what your strategy is, add some skills so that you can start building endorsements. Now, you can still add any skill you want, but if no one endorses you for that skill, it won’t matter because it will drop to the bottom and it won’t be as relevant or credible. So if you put “Being Awesome” as a skill, but no one endorses you for it, it won’t have a big impact. 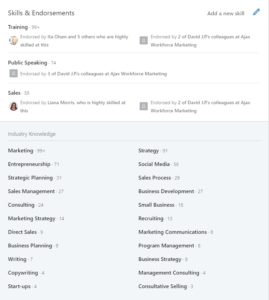 Conversely, if you are looking at a profile that has “Marketing” as a skill, and it has 28 endorsements next to it, there’s a much better chance that the person does know something about marketing. So you want to make sure that your profile accurately shares the message about your specific skill sets. Endorse the people in your network. You don’t have to endorse everyone for every skill they’ve listed. But if someone is good at at something, say so. This will encourage them to endorse you back and makes everyone’s LinkedIn profiles more accurate. And it’s a nice thing to do!